The Audubon preserve in Wellfleet includes 1,100 acres of salt marsh, sandy beach, pine woodland, and a freshwater pond that all attract a wide array of wildlife. 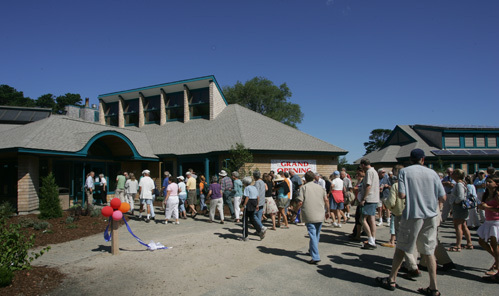 The 10,000-square-foot interpretive nature center attracts 70,000 visitors annually. The society wanted to minimize the environmental impact the visitor center would have on this ecologically sensitive area. With sustainability and the environment in mind, architects sought to design the “greenest” building possible. Nepon foam-flush toilets and Clivus composting and greywater systems eliminated the need for a septic system and reduced the overall footprint of the project. Solid waste is contained, treated and reduced by 95% in the composters. Greywater is filtered and sent to a shallow, reduced-sized soil absorption system beneath an ornamental garden where it is treated by the biologically active soil and where native plants take up nutrients. Not only does the garden add an attractive and educational element, it also provides food for birds and other wildlife. MA Audubon received the first US Green Building Council Leadership in Energy & Environmental Design (USGBC LEED) Platinum Award in Massachusetts.